One of the many challenges associated with being a mom is making the right choice when it comes to your child's health and wellness. The sheer number of options can be overwhelming at times, and the struggle to balance reality with the perception of perfection leads to only 4 in 10 moms saying that they are the best parents they could be. As part of the POPSUGAR Insights #Momstamina study, we wanted to better understand what moms want from brands, how brands can succeed with moms, and the role that native content and influencers can play in helping moms feel better about their skills as parents. At the end of the day, moms want to believe in the products they are purchasing for their children. After all, their children's happiness (68%) and health (46%) are the two things that moms say make them the happiest about being a parent. To ensure that they make choices that leave their children happy and healthy, moms want to buy brands and products that meet their standards. Overall, 63% of moms (and 64% of millennial moms) prefer brands that offer quality products at affordable prices. Moms want to buy from brands that are trustworthy (58%), authentic (31%), ethical (30%), and socially conscious (21%). Millennial moms are less likely to be concerned that the products are made in America (35% vs. 41% for moms overall) but are 28% more likely to say that it's important that the brand has great advertisements. Beyond offering a quality product, brands can offer value to moms in other ways. Brands can succeed with moms by providing value, removing barriers, or helping moms be successful in core areas of their lives. Today, one way that brands can provide those benefits is via native content. Moms see the value in native content too, and nearly half of millennial moms and 44% of moms overall prefer brands that offer native content. 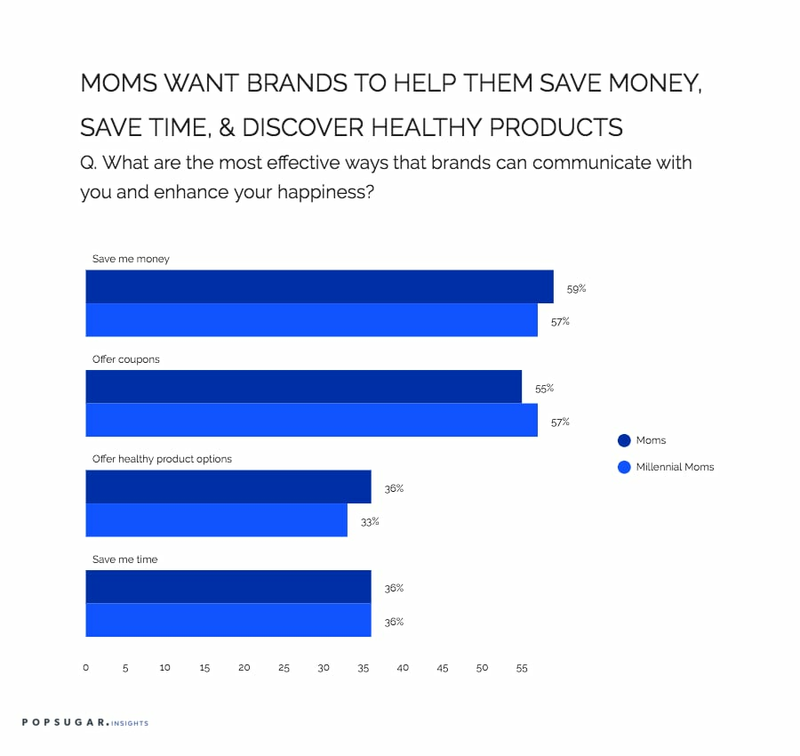 In terms of the most effective ways that brands can communicate with moms via native content, moms want brands to help them save money (59%), offer coupons to try new products (55%), help them save time (36%), or offer healthy product choices (36%). Over 66% of moms want brands to offer them useful information, advice from subject matter experts, or exclusive content. Millennial moms are slightly less likely to want brands to save money (57%) but more likely to want coupons (57%), and 8% are more likely to be interested in useful info, advice from experts, or exclusive content (71%). Brands have a significant opportunity to provide valuable content to moms that help them achieve their goals of helping their children live happy and healthy lives, and if brands deliver and offer true value via content they're creating, there's a good chance they can make a positive impact and increase the overall percentage of moms who feel they are the best parent they can be.